This 1950 documentary has exceptional Japanese wartime film clips, but the narrative lacks direction, historical detail, and objectivity. One of the program's goals is to show how Hideki Tojo, Prime Minister from 1941 to 1944, used battle newsreels to manipulate the Japanese people for his own purpose, but many parts of the documentary do not relate to this goal. A written statement at the beginning of the film states, "this picture is presented to the peoples of free nations, as a timely study of the ways of a dictator." This documentary came out in 1950, the year after China had been taken over by the Communists, so the film's writer appears to want to draw parallels between the Communist Chinese and the Japanese during World War II. However, the writer gives no detail on lessons to be learned from the Japanese wartime experience, other than demonstrating that film clips shown to the Japanese public many times did not represent the actual situation. The following statement illustrates the stereotypical, unsupported thinking in this documentary, "The Oriental soldier is an excellent soldier, as the world is beginning to realize today. He must have or think he has a cause, but once thus indoctrinated, he is a fighting man" . This documentary covers the war in the Pacific from 1941 to 1945, but few specific dates or years are mentioned during the narrative. The film clips are generally in chronological order, but sometimes segments go back and forth in time. The narrator often adopts a high, lilting voice when quoting Japanese persons, apparently done to sarcastically show the foolishness of the statements. At times this 1950 documentary starts to sound like a wartime propaganda film, rather than a serious historical examination of the battle footage showed by Japanese leaders to the public. Even though the narrator gives very few specific historical facts, several related to kamikaze attacks are incorrect or misleading. Lieutenant General Kawabe is presented as the "director of kamikaze operations in the final Philippines and Okinawa campaigns" , but actually the Navy led the operations, and Kawabe only had a part in leading Army kamikaze attacks, many times under orders from the Navy. 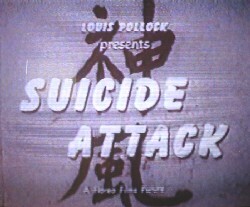 The film's footage shows Navy kamikaze pilots in the Philippines before departure, but viewers are given the impression that Kawabe directed this attack, even though he had no involvement. The documentary shows a four-minute segment on the Giretsu airborne suicide operation from mainland Japan to Okinawa, but the narrator does not clearly explain how this operation differed from normal kamikaze plane attacks on Allied ships. The Giretsu unit had nine planes that tried to fly into American airfields on Okinawa in order for soldiers to destroy as many planes as possible before dying in battle. During this suicidal attack on the night of May 24-25, 1945, one plane succeeded in landing, and ten Army soldiers came out of the plane to destroy 9 planes and damage 26 before U.S. Marines killed them (O'Neill 1999, 234-5). A critical review written when this documentary was produced says, "the events depicted, unless you were a part of them, will have only a passing historical interest. . . . one wonders if it was worth the effort" (quoted in Basinger 1986, 298). Suicide Attack contains some outstanding Japanese wartime newsreels, including several extended ones, but the rest of this documentary is definitely not worth the effort. 1. At 21:15 in video. 2. From 52:00 to 52:25 in video. 3. At 51:05 in video. Basinger, Jeanine. 1986. The World War II Combat Film: Anatomy of a Genre. New York: Columbia University Press.